Our surfaces are currently approved by the DDA (Disabled Disability Act2004) information. Grip Safes Resin Surfaces provide solutions to ensure you comply with the requirements of the Disabled Disibility Act (DDA) which came into force on 1st October 2004. 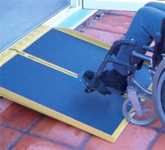 Disabled Access Ramps can be custom designed and coated to DDA standards, alternatively existing ramps can again be coated with DDA approved coatings. What happens if I fail to make reasonable adjustments? You might be breaking the law. A disabled person can make a claim against a provider whose services are impossible or unreasonably difficult for him or her to access. The Act states that service providers should not wait until a disabled person wants to use a service which they provide before they give consideration to their duty to make reasonable adjustments. They should be thinking NOW about the accessibility of their services to disabled people. Owners and landlords of buildings such as Shops, Offices, Restaurants and Bars or any public place need to be aware of the Act and ensure their premises meet the standards recommended. Failure to prepare disabled access could result in legal action from individuals who are likely to have the full backing of the Disability Rights Commission. One of the areas under review is the provision of suitable floor surfaces both externally and internally. Ramps, Stairs, Pathways and Flooring, are all areas that need to be considered and where necessary non-slip flooring installed. Decorative Resin Bonded Agregates have been used on numerous occasions for just these purposes. It is slip resistant in both wet and dry conditions, quick and easy to apply and can be used on almost any surface. You can contact us to arrange a site visit to discuss individual requirements.